Salvation And Survival: God's Love and His Justice: Are They In Conflict? 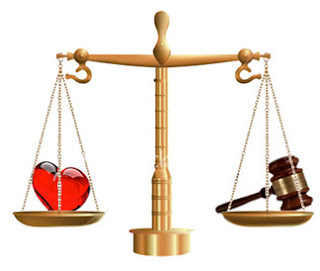 God's Love and His Justice: Are They In Conflict? Mark and I are so blessed to have friends with whom we can deliberate our theological views. We don't always agree and that's okay. I still think one of the most astounding verses in the Bible is Proverbs 25:2, God conceals the revelation of His word in the hiding place of His glory. But the honor of kings is revealed by how they thoroughly search out the deeper meaning of all that God says. Since we have been made kings and priests(1 Peter 2:9), royal lovers of God because of God’s grace and Christ’s redeeming blood, I can imagine how much it pleases our Father when we spend our lives trying to know Him more intimately. Our love and desire for more of Him does not require that we are in agreement on every theological question. So, I would like to present a question [or quandary] that one of our friends has been wrestling with; one that I know is difficult to reconcile for many other Believers, as well ... If God is love, as the Bible so clearly says in 1 John 4:8, then why all the Old Testament scriptures about destruction and judgment of the enemies of God? I guess the first thing that I have come to understand is that both Love and Justice are equal aspects of God's Nature. All of the attributes of God work in harmony to express the magnitude of His character and nature. I think, perhaps, that we Christians tend to look at Love and Justice as separate parts of God's essence; as polar opposites of who He is, so to speak. We tend to identify Him as the God of Judgment in the Old Testament and the God of Love in the New Testament. But does not the Word say that God never changes? That He is the same, yesterday, today, and tomorrow? Perhaps we need to come to an understanding that His Justice comes out of His Love for His creation; that they are intertwined. So, consider this ... God loves us, His creation. Deuteronomy 7:9 says, Know therefore that the LORD your God is God, the faithful God who keeps covenant and steadfast love with those who love him and keep his commandments, to a thousand generations. Adam and Eve experienced that covenant and love in the Garden of Eden ... and then they sinned. Sin came into the world and caused pain and suffering to all that God loved. He could not allow it to run rampant and continue to destroy the covenant He made with His creation. So, as an act of love, He renders His justice. Both love and justice are essential to God's purposes in the world -- to reconcile mankind back to Him. Justice and Love meet in this world when wrongs are righted and human beings are healed through God's loving discipline. We see the ultimate culmination of that process on the Cross. Jesus paid the price required by a Just God in the most loving act of all time. New Testament Christians have no problem seeing that picture of Justice and Love combined. But they still continue to struggle with the concept that Jesus says we are to love our enemies, yet they see God in the Old Testament destroy people and nations in His judgment. I think it is incumbent upon us to consider that the Bible is a history of God's relationship with mankind. In the Old Testament, His covenant with man was designed that we live in wholeness and fullness with Him; in an environment of peace. He then had to establish strict moral law to encourage man to keep covenant with Him. But man continued to rebel in his sin, and because God is Holy, He cannot excuse sin, and His integrity as a God of covenant and of steadfast, enduring Love requires that He destroy evil and restore good. I think we make a mistake when we look upon His justice in the Garden of Eden, Sodom and Gomorrah, in the ten plagues of Egypt; in His judgment of Pharaoh, Nebuchadnezzar, Nadab and Abihu as separate acts from His love. God was not acting out of an inflexible set of rules and punishing laws. There was a bigger purpose in play. We are deserving of death because of our sins, and most often, we do not receive the punishment that our sins deserve. What may look like the actions of an unloving God is actually the Father pursing His Justice in the context of grace -- His covenant is one of a commitment to care and honor the ones He loves; and unable to abide by the destruction of that covenant, God's Justice is an act of offering redemption to come back into covenant. We must also keep in mind that much of the destruction of peoples and nations in the Old Testament is against those not in covenant with God; those intent on destroying God's covenantal [yet rebellious] people, Israel. Out of His love to redeem Israel through the perfect seed line that would lead to Jesus, God's justice required that He destroy the nations who were corrupted with Satan's seed in order that He might keep the lineage to Jesus pure. Then there is the struggle Christians have with "God hardening Pharaoh's heart". Some see that as a conflict with the concept of God as Love. But again, we must look at it within the context of His covenantal relationship with Israel. But let me ask you this... How did God harden Pharaoh's heart? God revealed His love for His people Israel and His hatred of sin through the signs and wonders of the ten plagues. Can you perceive that this revelation of God's power and supremacy and enduring love for Israel were the catalysts for Pharaoh to harden his own heart? [The Bible even says in Exodus 8:32 that Pharaoh hardened his heart, not God]. His heart was so filled with hatred of Israel (SIN!) that he suppressed the revelation of God and refused to believe and receive God's grace. That is unrighteousness and resulted in God's righteous judgment. 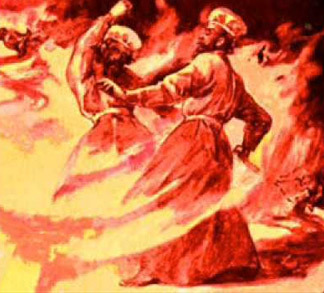 The incident involving Nadab and Abihu is a bit more difficult to understand, but I will offer my opinion.You might wonder what grievous sin of these sons of Aaron caused the fire of the presence of God to devour them. Scripture says in Leviticus 10:1 that Nadab and Abihu "took their respective [ceremonial] censers, put fire in them, placed incense on it and offered strange (unauthorized, unacceptable) fire before the Lord, [an act] which He had not commanded them to do". At this point, you have to decide if this judgment seems too extreme for the sin that was committed. But further verses in the chapter shed more light on this example of God's justice. This is what I see .... the fire of the presence of God is the Holy Spirit. Apparently, Nadab and Abihu offered the holy God an unholy fire. In fact, Moses says to Aaron, his brother and the [I'm sure] distraught father of Nadab and Abihu, "This is what the Lord said: ‘I will be treated as holy by those who approach Me, and before all the people I will be honored.’” God commanded that the bodies of the boys be taken outside the camp, and further instructed Aaron and his younger sons to exhibit no mourning before the congregation, lest they, too, experience the wrath and anger of God and die. You see, God IS Holy (morally and spiritually excellent) and He is to be honored as separate from everything evil, having not even a trace of evil [sin] in His character. It is what makes Him worthy to be "The God Most High". Incorporating any [unauthorized or strange] fire, other than Holy Spirit fire, would have been blasphemous to God, who made it clear He was to be treated as holy by those who approached Him. Furthermore, He was to be honored as separate from sin (Holy) before all the people. This explains why Aaron and the brothers of Nadab and Abihu were not allowed to mourn -- that would have been seen as a gesture of agreement with their dishonor of God. In addition, we get what may be another clue to the magnitude of the sin committed against God in this situation. In verse 8, the Lord spoke to Aaron and told him and his sons not to drink wine or any intoxicating drink before they entered the Tent of Meeting, in order "to make a distinction and recognize a difference between the holy (sacred) and the common (profane), and between the [ceremonially] unclean and the clean". Perhaps in addition to the unholy fire, Nadab and Abihu were intoxicated before the Lord.God intends that those He is in covenant with will recognize His holiness and treat Him as such. Anything less devalues Him and results in death, the only justice worthy of His covenant and steadfast love. That is how God revealed Himself as He established His character and nature in the Old Testament. In the New Testament, Jesus offered Himself to satisfy God's justice. Jesus [as God, Himself] came to show us how to express God's love for His creation, and His Goodness is evident to all. And at this point, I want to say that the modern Church is in danger of diminishing the role and power of God's justice in favor of a message that God is ONLY love. Nothing could be further from the truth! God has not changed! Rather, He expects us, as inheritors of His grace and love, to represent His holiness to the rest of humankind to bring about redemption [for all who will receive it]. Unlike Nadab and Abihu, we are to reflect God's holiness and show the difference between the sacred holiness of our Father and the common profane nature of Satan. We are to offer His divine nature to the world, and for those who accept it, it will be Life. For those who reject His offer of redemption from their evil ways, His justice will prevail at the end of the age -- because darkness cannot survive in the Light. In my final analysis, God's holiness requires that there be justice and a penalty for sin. But God's steadfast and enduring love desires that all humans be reconciled in relationship with Him. Ultimately, like Adam and Eve, the inhabitants of Sodom and Gomorrah, Pharaoh, and Nadab and Abihu, each of us must make a decision to recognize that God is holy, and worthy to be treated as such. The refusal to do so [as acts of rebellion] will result in consequences that reveal His justice. It is His divine nature and who are we to question it? Psalm 37:28 The Lord loves it when He sees us walking in his justice. He will never desert His devoted lovers; they will be kept forever in His faithful care. But the descendants of the wicked will be banished. That is good enough for me, I don't need to know why he allowed rebellion in his creations, how long it took to create, what was he doing before he created the universe, why he was so hard on Moses not letting him go into the promised land, etc.